While our knitting tours are hugely popular, a lot of our previous knitters said they would like to come back to Ireland to simply relax and knit! So here it is, our Luxury Donegal Knitting Retreat. When you arrive at Dublin airport we will take you on a panoramic tour of Dublin where you will see all of the major sites and attractions. The next day, head for Donegal on the Northwest coast and meet your host and famous Donegal Knitter, Edel MacBride. 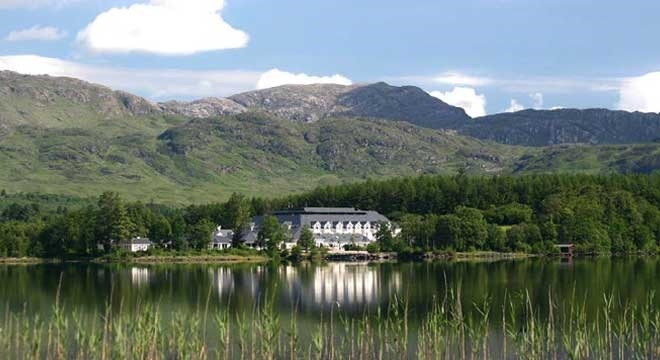 You will spend four days with Edel in the Luxury Harvey’s Point Lakeside Hotel. We will have optional touring throughout the four days, should you wish to take in some of the local crafts! Harvey’s Point Hotel has a reputation for excellence, having been named ‘Ireland’s Best Hotel’ in the TripAdvisor Awards three times in a row! Transfers on arrival and departure by private coach (for arrivals prior to 11am on tour start day). Sightseeing as per itinerary in a luxury coach with an experienced driver and accredited guide, entrance fees included if applicable. The company of your knitting host Edel MacBride for 4 days. Begin your knitting retreat with a transfer to your hotel (for arrivals prior to 11am). At 1pm enjoy an optional panoramic tour of the city where you will pass by all of the major sites. Stop at the GPO Witness History Museum; located in one of Dublin’s most famous buildings the museum tells the story of the 1916 Rising in Dublin through special effects, soundscapes and stories from real Irish people. Next stop is the Constant Knitter Yarn Shop which is one of Dublin’s best yarn stores and houses a nice selection of both Irish and European yarns and accessories. Return to your hotel where you will have time to relax or take a walk around Dublin City before your evening welcome dinner at the hotel. Overnight in Dublin, Dinner, Bed & Breakfast Included. Today your knitting retreat begins in earnest! Board the coach and relax as you begin your journey to Donegal, stopping along the way at Carrickmacross Lace to see the fine lace masterpieces that have been produced in the region since the early 1800’s. Enjoy a demonstration where staff that are passionate about the beauty of this meticulously created craft will show you the intricate needlework involved with creating the finished pieces. After your visit, return to your coach and travel to the Ulster American Folk Park in Omagh. The Park explores the historical link between Ulster and America, focusing particularly on the lifestyle and experiences of those immigrants who sailed from Ulster to America in the 18th and 19th centuries. Of particular interest to you may be the weaver’s cottage where you will see an authentic handloom which would have been used to weave tweed or linen by the man of the house while his wife spun the flax fibres into yarn and the children carded and combed the flax in preparation for the spinning wheel. Staff here will give you a demonstration on the spinning wheel and tell you all about traditional yarn dyeing methods. After your visit continue to Harvey’s Point Hotel and meet your host, one of Ireland’s finest knitwear designers, Edel MacBride. You will spend a lot more time with Edel and her team over the few days spent in Donegal, so this evening is an informal get together and ‘get to know each other’ session with some informal knitting thrown in for good measure! Overnight at Harvey’s Point, Dinner, Bed & Breakfast included. Throughout your knitting retreat Edel will be helping you along with your project which you will start today. Both projects have been designed by Edel especially for this knitting retreat and you will choose your preferred project based on your knitting proficiency, the options will include the Swan Lake Cowl or Peggy’s Taepot (We haven’t spelled that wrong, it is done the Irish way!). The Swan Lake Cowl Pattern is Medium to difficult but with options to work an equally lovely beginner version and involves travelling cables and optional colour work. The Taepot is a wonderful Aran based tea cosy with quite a story behind the inspiration, it involves cables and simple lace work. Both projects are worked in Edel’s custom designed Sliabh Liag Yarn and Momer her new merino- mohair blend. Yarn and patterns are included to complete your chosen project, you will need to bring your own needles and we will advise the size requirements in advance. This afternoon partake in some Cookery Demonstration at the hotel followed by a Spinning & Dyeing Demonstration with Mary from Markree Woolcraft who will demonstrate traditional Irish spinning techniques on a Donegal Spinning Wheel and talk to you about how she dyes her yarns using hedgerow plants and lichens. All year round you can enjoy the magnificent landscape that surrounds Harvey’s Point on the Shores of Lough Eske overlooked by the beautiful Blue Stack Mountains. This evening, why not take a walk around the lake or further afield. Overnight at Harvey’s Point, Dinner, Bed & Breakfast included. Today if you prefer to stay at Harvey’s Point you can do that or join us for a tour of Western Donegal. If you do decide to tour with us, bring your knitting as Edel will be touring with you! Begin your day with a visit to Studio Donegal, a hand-weaving and clothing manufacturing business committed to preserving and promoting traditional Irish hand-weaving. Here you will see the process of hand-weaving including the spinning, warping and weaving of the wool. Beautifully tailored vests, jackets and homeware products are made on site from their own fabrics. Studio Donegal’s soft Merino yarn is dyed and spun in the region and sold on site. Next stop is the stunningly beautiful Slieve League Cliffs some of the highest and finest marine cliffs in Europe and the inspiration for Edel’s locally spun Sliabh Liag wool; we will have a quick bite to eat before we continue with the tour. Travel onward to Glencolmcille Folk Village and spend some time Knitting with The Locals. Knitting was an integral part of the income of families in Glencolmcille. Spinning, weaving and dying of wool also played a huge part in the lives and culture of the locals. Glencolmcille was very much a fishing community and the Aran sweater was both a necessity and second nature to the people. Rita Cunningham grew up in Glencolmcille, her father Francie fished out of the now deserted fishing village of Port. Rita as a child remembers the woman gathered around a quilting frame in an old thatched cottage in Port, stitching a special naturally dyed red flannel onto a quilt. One of the women in this village passed on a Fair Isle pattern to Rita that would pass down the generations through her own family. Immerse yourself in this unique pattern and stories from the ancient coastal Geltacht parish of Glencolmcille with Rita and other local knitters. Afterwards, enjoy a short visit to Rossan Knitwear and see three generations of the McNellis family hand looming knitwear. The Rossan collection is produced at Glencolmcille Woollen Mill which looks out upon the end of the Celtic trail. The Rossan collection of knitwear carries both modern and traditional designs, much of which reflect the Donegal landscape. This evening meet back at Harvey’s Point for your Dinner and Cabaret Show featuring some famous Irish performers. Overnight at Harvey’s Point, Dinner, Bed & Breakfast included. Today if you prefer to stay at Harvey’s Point you can do that or join us for a tour of Eastern Donegal. If you do decide to tour with us, bring your knitting as Edel will be touring with you and there will be plenty of opportunities to knit along the way. Visit Glenveagh National Park where you will find 16,000 hectares of stunning mountains, lake and wild bogland. Walk around the visitor Centre, tour the castle with its wonderful Donegal handmade rugs and enjoy a walk around the maze of gardens which include a multitude of exotic and delicate plants. Greta Garbo was once a guest here! After your visit, return to your hotel and relax with your knitting before enjoying a trunk show with Edel and possibly some of her designer friends in the hotel’s reading room. Continue to the heritage town of Ardara which is famous for its tweed makers and hand knitting. The coach driver will stop in a central location and Edel will accompany you to some nearby outlets including The Donegal Designer Makers, a shop featuring the collections of local award winning craft makers, Kennedy’s Traditional Hand Knitters or Handwoven Tweed a small hand weaving business run by local man, Eddie Doherty. After about an hour or so to explore Ardara or do some shopping, return to your hotel and relax with your knitting before enjoying a trunk show with Edel and possibly some of her designer friends in the hotel’s reading room. Overnight at Harvey’s Point, Dinner, Bed & Breakfast included. Today we check out of Harvey’s Point and make our way back to Dublin, stopping along the way at Swallow’s Studio Liz Christy creates beautiful handwoven products on a traditional loom and inspired by her favourite artists, Monet, Gauguin and Edward Hopper. Continue to Dublin where there will be time for personal sightseeing or shopping before dinner. This evening your final farewell dinner will be served at the hotel. Overnight at the Gresham Hotel, Dinner, Bed & Breakfast included. After your final Irish breakfast depart the hotel for Dublin airport arriving in time to complete check-in formalities and that last minute duty free shopping. A deposit of 20% of the total tour price is required to hold your booking. The balance of the tour is due 60 days before arrival and can be made in instalment payments on request. 4 weeks or longer prior to start date deposit will be forfeit and non-refundable. Should you wish to change your tour to one of our other tours or to a different date, an amendment fee of €250 per person will apply. Within 4 weeks cancellation fees will apply.